About me | Communicate with meaning. I’ve created this blog to share some of my thoughts on communication, verbal and written, based on years of experience in the corporate world and academia. I’ll also share information, links and stories I believe may be of interest to you, the reader. Stories and images that inspire me. Advice and tales that touch my heart. Notions about the world and where I think we’re headed as a society. There’s also a second purpose to this blog (at least for now). I’m seeking a challenging career opportunity. Simply put – I’m looking for a job! I’m a results-oriented, strategic communicator with years of communications, marketing and public relations experience. I’ve been a marketing director at a hospital, developed copy for online and traditional marketing channels, taught public speaking and much more. That’s the short version of my experience! Of course, job leads are welcome and appreciated. You’ll find my resume on this blog along with some writing samples. Thanks for stopping by! 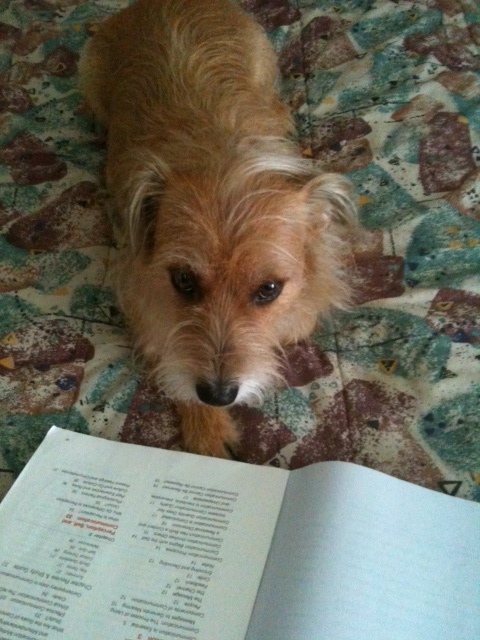 My terrier mix Levi enjoys learning.